This collection consists of records from the files of Alexander Vershbow related to Bosnia and Herzegovina from 1994 to early 1996. The collection includes documents previously declassified as part of the Central Intelligence Agency’s program “Bosnia, Intelligence, and the Clinton Presidency: The Role of Intelligence and Political Leadership in Ending the Bosnian War.” It also includes several publicly released United Nations Security Council decisions regarding the former Yugoslavia as well as a number of recently declassified Summaries of Conclusions of Principals Committee and Deputies Committee meetings on Bosnia. 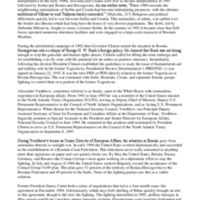 The files also contain letters, memos, and drafts related to former President Jimmy Carter’s efforts to achieve a cease fire agreement in Bosnia.